The warm season is getting closer and you need to find shoes to match lighter colored outfits. As you might know, tan is one of the next season’s colors. So, what could it better than a pair of shoes with a shade of tan. Stacy Adams Dover Ornament Slip-On Shoes with perforated details and metallic ornaments should be in your closet in the next season. And what’s even better, they’re on sale. 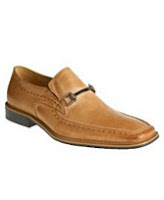 With just $50 you can buy leather dress shoes that will be a hit in the coming months.